I hadn’t read a novel by Stephen King in years. Though I would have considered myself his number one fan back in the early days of King’s writings, I found myself let down more and more in later years. It seemed his novels got longer and longer, but in a more rambling way and I found myself skipping through parts in search of action. I finally had to give up and didn’t read anything by King for probably ten years. Then I took a chance and picked up Under the Dome and though it was long, I found myself getting caught up in the story. I didn’t love it as I did novels like—The Shining, The Stand or Carrie, and it did take me almost a month to finish it—but for the most part I found I enjoyed it. Then my daughter came home from college last week raving about this Gunslinger series. Her words—‘You have GOT to read these! I LOVE them!’ She even brought the first one with her, The Gunslinger, just to make sure I had a copy. I haven’t seen my daughter get so excited about a book(s) since she read The Alien Chronicles, a sf saga by Deborah Chester back when she was ten years old. Surprise, surprise, it only took me two days to read The Gunslinger and my daughter (Kari :)) was right. I loved it! The old excitement I used to feel when picking up a new novel came roaring back. Was I just in the right frame of mind on this one? Can’t say. But the story grabbed me right from page one and I had to force myself to put it down to take care of normal everyday business—like feeding the family, washing clothes etc. I had the old Stephen King “smile” back. Yah!! Roland is on a quest. He is chasing the man in black because he needs to learn what this stranger knows about a mysterious lone tower. 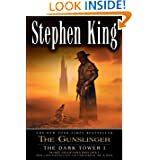 Roland, or the gunslinger, as we start to think of him, will travel to the ends of the Earth, and any other dimensions he might run into, if he has to in order to reach this mysterious tower. He’s not even certain what will happen when he finally gets there, only that he must. But at what cost? Jake is just a young boy the gunslinger finds in a deserted station in the desert and Roland knows he must take Jake with him. He grows close to the boy and enjoys his company. But Roland is haunted because he fears the time is coming when he will have to make a choice between catching up with the man in black, or saving Jake’s life. Jake understands this as well and doesn’t know if he can trust the gunslinger, a man he has grown to love in the short time they’ve been together. Roland is a hard man, but he also has a high sense of honor. I won’t give anything away here, but the end of this novel had me chewing my nails down to the quick. It’s been a long while since I’ve read anything I’ve enjoyed so much. I hope the others in this series will continue in the same way, because if they do, this series may very well drop my long-time King favorite, The Stand, down to second place. Posted by Denna Holm on April 8, 2012 in Archives and tagged fantasy, five star review, gunslinger, King, saga, sf, Tower. Oh man, the other books in that series are totally different. Not really surprising, given that the first book was one of the first ones he wrote, and he published it many years after he started writing it, then followed up with the others at his usual pace. It does take a few books before he takes a left turn to meta-ville, but even if you just line them all up on a bookshelf you can tell from the relative sizes that things change. Did you read them all? I’m on book three now and there have been a few places where I skimmed, though so far I’m still enjoying the series. IMHO, it gets a bit more self-conscious around book 4 and 5, and 6 and 7 are where King really cuts loose and just starts getting all meta and glaringly foreshadowy bringing in characters from older books and so on.